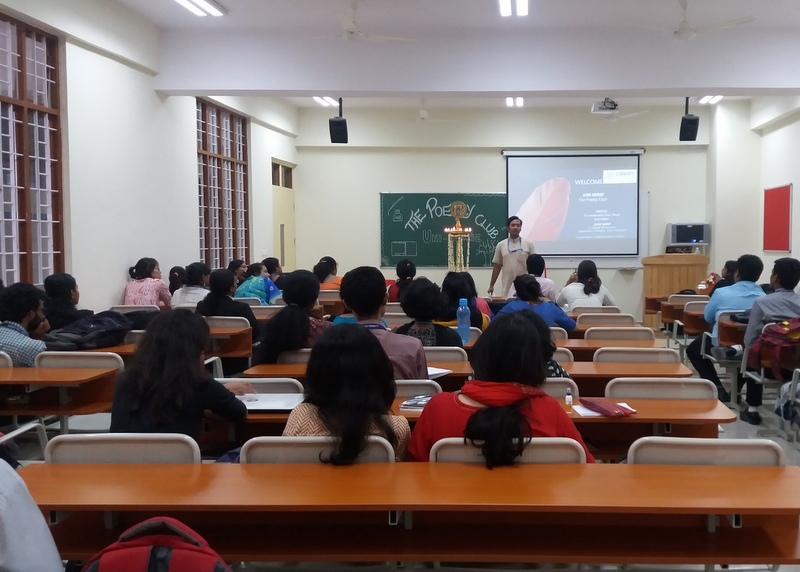 The Economics Department of Christ University Bannerghatta Road Campus conducted its second event in the Speaker Series on Tuesday 26th September 2017. The guest for the day was Shri.Feroze Varun Gandhi, who spoke on the topic “India’s Economy Rewired”. Shri. Varun Gandhi is an Indian politician, a poet and a columnist. As a member of Lok Sabha, he represents the Sultanpur constituency. He is a member of the Bharatiya Janata Party and was inducted into Rajnath Singh's team in March 2012 as National General Secretary, becoming the youngest General Secretary in the history of the party. The program commenced at 11:45am with the welcome address being delivered by the Associate Dean, Dr. Jyoti Kumar.Shri Varun Gandhi was later presented with a sapling by the Academics Coordinator, Ms. Gaana J.Shri Gandhi began to address the gathering by painting a contrasting picture of India in the 1960s and the India of today. In due course of his oration, he identified three sectors of India that are in need of immediate reformation- education, healthcare, and agriculture. He elaborated upon the poor state of public education, public healthcare, and the precarious volatility of the agricultural sector. demographic dividend, both of which he declared needs to be tackled through political reform. He also pointed out a multitude of problems in the folds of Indian politics, some of which were the hiking of salaries by representative themselves, the lack of women’s reservation, and uniform voting in the Parliament. Inspired by the progressive systems in place in countries such as Italy and Jordan, Shri Varun Gandhi suggests the facilitation of this reformation through methods such as transparent petitioning and encouragement of social entrepreneurship and youth movements. Shri. Varun Gandhi’s speech was followed by a brief question and answer session with the audience, wherein important issues such as the requirement for controlling the rising co-operative consolidation and the grey area of the politics of criminalisation was brought to light in fruitful discussion. The session concluded at 1:15pm with the Vote of Thanks being presented by the Assistant Professor of the Economics Department, Dr. Pious Thomas. 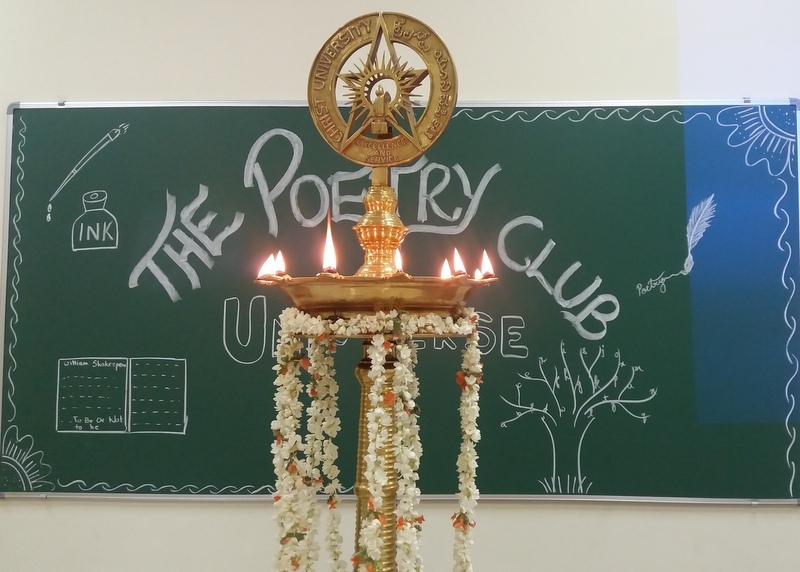 On the 6th of July, Uni-Verse, the poetry club of the Christ University BGR campus was inaugurated amongst a small gathering of passionate students and teachers. The event took place after college, from 3:40pm, for an hour in room 409. Jacqueline Williams of Second English Honors was the emcee of the event. The occasion was graced by accomplished poet Bidyut Bhusan Jena, who is also an Assistant Professor at the main campus of Christ University. His address left the audience in awe of him, his poetry and his almost magical ability to capture the attention of the listener. “Poetry marks the homecoming of the soul” he said, and it was to the soul that he spoke with his words that came out of his mouth like poetry. Every other line a beautiful quote by a beloved poet. In the interactive session he was questioned about his preference of the words of others over his own to convey his thoughts. With the eloquence only a poet could have he answered that question. He said that the greats have left behind for us a body of work, of unfinished meanings and that it is up to us to continue the unfinished, to make sure that history is picked up and to make sure the past is in the present and in the future. He spoke extensively on the importance of memories and love. How “poetry eases the broken strings of your heart”. A very unique thought that he extended was that poetry is not heard, it is overheard. It’s the personal thoughts of the poets that the reader or the listener peers into. A world beyond their own. He talked about how to him poetry doesn't lie in the complexity of the words used but the images you create with them. He then recited two of his pieces; the room was at that moment filled with poets creating vivid images out of his words in their minds. The address and interactive session was followed by recitals by two of the coordinators of the club, Merve Kucukzoroglu from First Journalism Honors and Sre Ratha from Second Journalism Honors. Both of them received by thunderous applause and appreciation. The audience was then briefed about the upcoming plans and events of the club and those interested were signed up at the venue. Dr. Bidyut was kind enough to interact with all the students who had queries for him or simply wanted a one on one conversation with him. His presence, the enthusiasm of the coordinators, of both of the student body and the faculty and of course all the enthusiastic poets in the audience made this inauguration one that has successfully paved the path for young budding poets. It was an eye opener session which helped the students to get an insight about Supply Chain Management operations. She highlighted the increasing demand for qualified logistics professional in domestic & International markets.The Speaker gave insight of how supply chain principles and processes are critical to supporting and delivering services .She also discussed as how goods availability (components and finished goods) must be coordinated with resources and expertise to meet a service demand. The topic also covered the evolving and maturing nature of services based businesses and basic understanding and awareness of how to market your skills and knowledge in Supply Chain management across multiple service based industries.